Back when I was writing the Node-RED Alexa Home Skill node I used an example oAuth setup I found online here. This worked for the initial setup but I couldn’t get Alexa to renew the oAuth tokens, as a temporary work around I set the token life to be something huge (300 years…). Again this worked, but it’s not the best and even thought I’m not likely to be around in 2318 to worry about it having crazy long token expiry times negates some of the benefits of the oAuth system. I spent a couple of weeks bouncing email back and forth with the Alexa team at Amazon trying to work out what the problem was and I thought it would be useful to write up the findings to make life easier for anybody else wanting to use NodeJS/Passport to implement an Alexa Skill. I created a separate stripped down minimal skill to work through this without having to mess with the live skill and disrupting users and the whole thing is up on github here, but I’m going to walk through the changes here. Let’s start by looking at what we had to start with, the following snippet of code is the part that returns a oAuth token to the remote service (in this case Amazon Alexa) when the user authorises it to use my service. This returns the absolute bare minimum (the 2 fields marked as required in the spec) for the oAuth spec. The first fix is to add refresh token that can be used request a new token. To do this we need to add a new model to store the refresh token and it’s link to the user. And now to create a refresh token and add it to the token response from earlier. OK, so now we have a token response that looks like this. This was basically what I was using when I launched the service, it has all the required fields and a refresh token. Amazon’s Alexa Smart Home API has an explicit error to return when a token has expired, so with that in mind I had assumed that when I return that error then the service would use the refresh token to get a new token. This assumption turned out to be wrong, even if you explicitly tell Amazon that the token has expired it won’t try to refresh it unless it is after the expires_in time in the token response… Now expires_in is listed as optional (but recommended in the spec) but it turns out that Amazon interprets a missing expires_in as tokens having an infinite life and as such will NEVER renew the token. To fix this we need to include an expires time. An expires time is already in the token model for the database (remember I’d already edited this to be 300 years) so we just need to get it included in the token response. This worked, the first time the token expired (in 90 days) but not the second time, because I’d not included a expires_in the token response when the token was refreshed. As I said at the start all the code for a bare bones implementation is on github here, there are a couple of other changes, e.g.to make the system reuse existing tokens if they are still valid if the user removes and adds the skill to Alexa, to change the token type over to Bearer and including the scope information in the token response just to be complete. Should I ever get enough free time to work out how to get the model to work for a Google Assistant version of the Node-RED node this code will form the basis as that also needs an oAuth based service. A few years ago I create a web app to allow people to order their own sets of Moo stickers with the MQTT, Node-RED and Owntracks(at the time called MQTTitude) logos. These worked well with people ordering about 1 pack a month until Moo changed the way they did authentication. I didn’t have time to fix it until today. I’ve moved the app from being a J2EE app over to one written in NodeJS using express, this along with the change in Moo’s authentication method has made the code a lot shorter and easier to read. I’ve published the new code on github here. Ever since Tracks2Miles shipped users have been having problems authorising the app if they choose to log in with their Facebook credentials. The problem is that once the user had logged into Facebook it would redirect to a blank white page. Last night I had another look at what was causing it. I poked around at this for a while, but didn’t get very far, until Chris Banes pointed me at the source for the facebook-android-sdk, specifically the FbDialog. When I added some trace to the onPageStarted() method I made some progress, the output from this implied that Facebook page had actually loaded successfully and redirected back to dailymile. 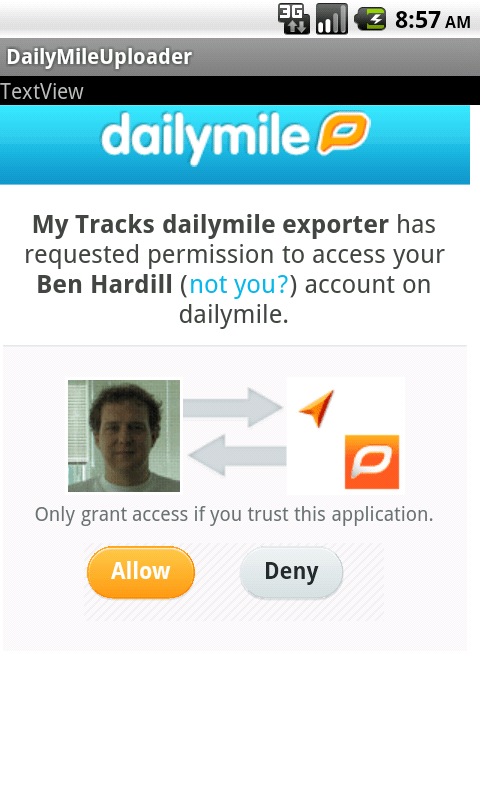 I also pointed the problem out to Ben from dailymile and he has fixed the cert mismatch with in a couple of hours. There will be an updated version of Tracks2Miles in the next few days with these changes (just to be safe) and a couple of other updates around distance units. In my last post I talked about a project I’m working on to export GPS tracks from My Tracks directly to dailymile. I was having problems getting the mobile client flow for oAuth 2.0 to work with dailymile. As a work around I decided to see if I could get the User-Agent flow to work for this application. At the end of the previous post I suggested using an Intent filter to catch a redirect to a custom URI schema, while I got this to work it was messy as it left the browser app on the activity stack during the authentication. While looking for a way round this I found the documentation for the WebView widget and came up a much better solution. The WebView widget allows you to embed HTML content in your application so it should be possible to embed the web based authorisation set into a Activity. Now I’ve got the AuthToken I can tuck it away in the Android AccountManager so I can grab it later when I want to upload a training session. The recent switching off of Basic Auth by Twitter meant I had to rework some of the applications I have running at home. One of these application bridges Twitter to my local MQTT broker so that any DMs and mentions get published to two topics and also a topic that updates my status to what ever is posted. The original version of the application just made basic http requests and parsed the XML responses, rather than just try and bolt on OAuth support I thought I would be better to start again and use one of the existing libraries that drive the Twitter APIs. There is a list of libraries for different languages http://dev.twitter.com/pages/libraries, I had a bit of a look at a couple of them and settled on Twitter4J. 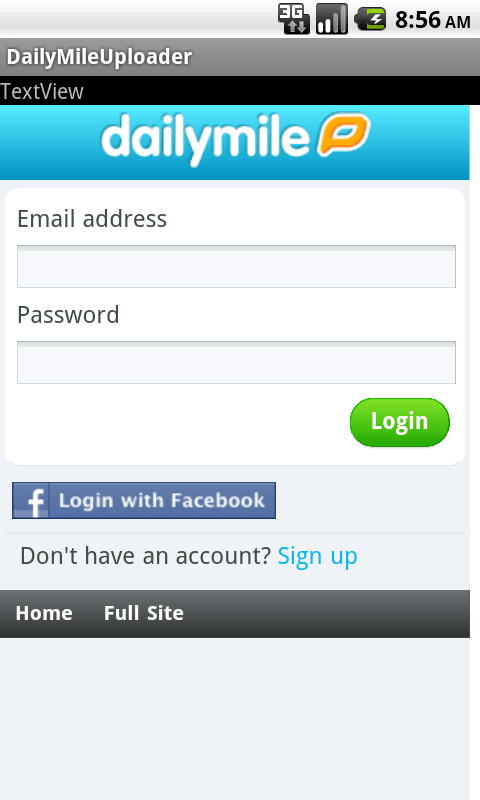 In order to use OAuth you need to register your application with Twitter, you can do that here http://twitter.com/apps/new. Once registered you will get Consumer Key and a Consumer Secret. Because Twitter are using these keys to help to cut off spammers, keys need to be kept secret in order to prevent spammers knocking legitimate applications off-line, If you want to build the code attached here you will need to apply for your own key. Before you can use a Twitter application you need to authorise it to act on your behalf, this is a 3 stage process. The application creates a URL based on it’s Consumer Key and Consumer Secret. The user follows the URL and signs into Twitter and is then asked if they want to allow the application to access on their behalf. If they allow the application then Twitter supplies a PIN. The user passes the PIN to the application which uses this to retrieve a Token, This Token is used to authenticate the application when ever it needs to act on the users behalf. Each client needs a unique id, or the older client will be kicked off when the new one collects, if you want to run multiple versions of the bridge then it may be a good idea to append the OAuth access token or the twtter screen name to the clientID. Taking all that and knocking some of the rough edges off I have an app that will publish DMs on Twitter/<screenName>/dm & mentions on Twitter/<screenName>/mention and listens on Twitter/<screenName>/send for status updates to publish. There is a second app which subscribes to the mention and DM topics and forwards these messages on to the topic that sends SMS messages to my phone. Next on the list of additions is a filter that will forward photos attached to tweets as MMS messages and probably some support for bridging search terms as well. You can download my code from here, remember you will need your own Consumer Key and Consumer Secret to build it yourself, but there is a pre-built version with a valid key included.